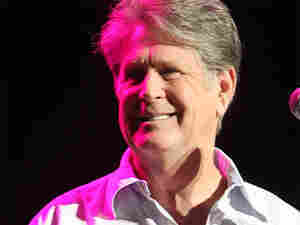 Brian Wilson In Concert It's fair to say that this music, recorded live at the Warner Theatre in Washington, D.C., is the best new material from Brian Wilson in more than 30 years.That Lucky Old Sun is a song cycle based on a tune with its spiritual roots in slavery. That song is about hardship, but this semi-autobiographical song cycle is about nostalgia. It's what life in California means to Wilson, and what Wilson means to California. It's fair to say that this music, recorded live at the Warner Theatre in Washington, D.C., is the best new material from Brian Wilson in more than 30 years. That Lucky Old Sun is a song cycle based on a tune with its spiritual roots in slavery. That song is about hardship, but this semi-autobiographical work is about nostalgia — what life in California means to Wilson and what Wilson means to California. It also marks a collaboration with his partner from the legendary Smile recordings, Van Dyke Parks. Parks contributed some of the spoken-word performances that weave this roughly 35-minute work together. What's most remarkable about That Lucky Old Sun for me is the talent of the band behind Wilson. Scott Bennett helped with lyrics and songs; Darian Sahanaja worked on helping the song cycle flow smoothly from piece to piece. Jeffrey Foskett worked with Wilson on the vocals and harmonies, while Paul Von Mertens contributed orchestral arrangements of horns and strings. It's a collaborative work, different from much of the way Wilson would write songs with The Beach Boys. That Lucky Old Sun was commissioned by the Royal Festival Hall in London and premiered there in September 2007. One year later, a CD companion of the same name was released. Here, we have a recording of the entire suite, recorded on Nov. 18 at the Warner Theatre in Washington, D.C. and mixed by Mark Linett. You can also hear an interview with Wilson and his band, who tell the story of how this music came to be and shed some light on their creative process.